Feeling safe is not longer enough today. Each of us has the responsibility to provide our own protection when faced with an immediate threat to our family or ourselves. Help may not be available or is too far away when you need it. Getting educated about Firearm Safety will bring you peace of mind. Whether your need is for a Utah Concealed Firearm Permit (CFP) also known as a Concealed Carry Weapons permit (CCW) or you are looking for additional defense training with your firearms, SDS has your training class. 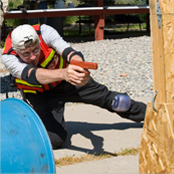 More importantly, we give you the information and teach the firearm skills you may have to use in real life situations. We fully believe in proper training because your life may depend on it! If you ever have to use a gun to defend yourself or your family from an assailant, you will always revert to your previous training, if you have any at all. We can help you improve. Our Firearms Training page will give you the details. Find out why Self-Defense Solutions has been the choice of those seeking competent, dedicated and passionate firearm instruction right here in Utah.